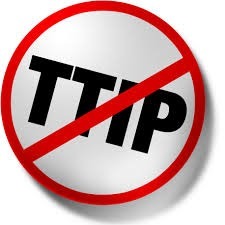 TTIP is the Trans-Atlantic Trade and Investment Partnership. Its purpose is to lift the barriers for further trade development between the European Union and the United States of America. It is negotiated behind closed doors. There is little official information so we rely on leaked documents. European MEPs that will be called to vote on it have no information on it and no influence. The benefits described are with the most optimistic scenarios and numbers. One of its main advantages is the 0.5% growth of GDP of the European Union (under the optimistic scenario). But if one looks carefully will notice that it refers to a period of 10 years from the implementation of the agreement! This means less than 0.05% on average, per year! For such a great agreement as they say it is, this “optimistic” scenario seems too little! Another advantage is that they believe 400,000 will be created in the next 10 years in the European Union and few more in the U.S.. Again a very small number specifically for the optimistic scenario. Taking into account that the corresponding agreement between the U.S., Canada and Mexico, NAFTA has cost the U.S. around 700,000 jobs instead of the 200,000 promised, we understand that nothing is certain. Taking into account the labor costs of the EU, I believe one of two will probably happen. Either the wages will fall dramatically in EU and labor rights will be f to create these positions or thousands of jobs will be lost, transferred to a cheaper America. Both naturally mean less growth and nothing else. How did the calculate these advantages? Only by removing tariffs? I don’t disagree that removing tariffs will lowerthe cost of products that we export and import. But no; these advantages are derived from removing other “obstacles” such as differences in regulations between the two. Some currently applicable laws distinguish between European and non-European companies in Europe and U.S. and non U.S. companies in U.S.. And here comes the ISDS (Investor-State Dispute Settlement). Supposedly this piece of international legislation allows companies to solve their disputes through an independent international court in case of discrimination by the states that have signed it. The truth however is a little different and a lot more dangerous, despite the fact that the mediators are trying to convince us it is not. ISDS allows companies to sue states on lost future profits from regulations. For example, Philip Morris sued the government of Australia (that has signed the TPP – ISDS) when it passed a law for the appearance of cigarette packages, aiming to protecting the public health. That regulation was for all companies, not just for foreign ones. Despite that, a lawsuit was filed on the grounds of lost future profits because of the difficulty to recognize the brand name of Philip Morris on the new packages! The regulation was passed as a law, but Australia is now in a litigation for imagined profits! So, what is the usefulness of ISDS here? Just to blackmail governments into changing or not passing laws they have a right to, for the protection of their citizens. In essence, investors and money is above the rights of citizens and their governments! Unacceptable. So as no one says there is no solution here, a simple agreement not to pass laws that discriminate between domestic and non domestic companies would suffice and would be accepted by all. However, the ISDS wont. From leaked documents we also know that there is also an anti-localization agenda in TTIP giving more rights and unequal opportunities to companies that can operate in larger scale. It is unacceptable that the TTIP process continues this way. All documents exchanged should be public so we and are delegates in the parliament know what is really going on. The first thing we ask is for transparency and not some general assurances by the commissioner, Karel De Guht while he smiles and scorns those who look at his work with scepticism. Posted on June 11, 2014 by vaspervnp@yahoo.gr. This entry was posted in Article. Bookmark the permalink.